On October 6th, AS220 hosted a panel at the Peerless Building entitled “Unpacking Authentic Placemaking” as part of the programming leading up to their 30th Anniversary Celebration. This panel, moderated by Marc Levitt, comprised of Bert Crenca, Rick Lowe, Myrna Breitbart, and a Cornish Associates’ favorite, Andrés Duany. With a packed atrium, the group engaged in a lively conversation about place-making in cities, touching on a gentrification, youth, and city politics. At the end of the evening, our own Buff Chace was honored for his authentic creative place-making contributions to the city of Providence. 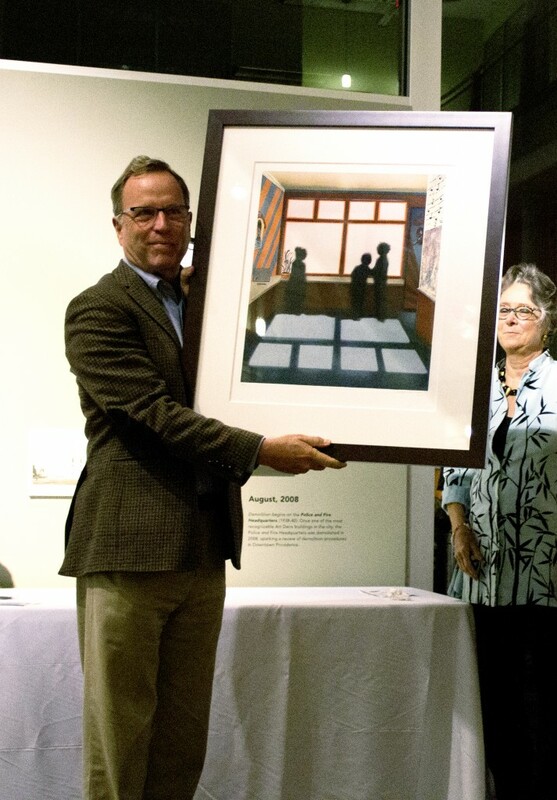 He received No.1 of 220 prints (produced by AS220 Print Shop) of a work by nationally recognized Rhode Island artist, Gretchen Dow Simpson.